Can we tell you a secret? 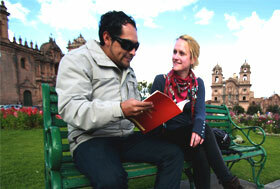 We consider classrooms a bit boring, especially now that you’ve come from so far all the way down to stunning Peru! Our Spanish method is based on the thought, that you have come to Peru, to be in constant interaction with the people and the culture. You want to be immersed in Peru right?? And we consider that a classroom is NOT the best people to achieve this goal. And Cusco is amazing so why would you want to be in a classroom anyway? 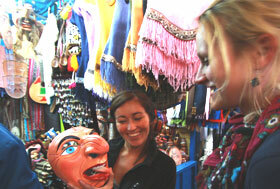 We will teach you Spanish there where it’s spoken: in a bar, in a restaurant, in a shop, at the market, on a square…. As we already said…. our Spanish lessons not only SOUND Spanish but they SMELL and FEEL Spanish. All our Spanish teachers are native speakers, have university degrees and are trained according to latest principles of second language training. But on top of that, they are selected by us because they are fun, friendly, creative, inspiring and patient people! So you are guaranteed to have good and also entertaining classes. We are familiar with the levels of the Common European framework of Languages and of the Instituto Cervantes and will be happy to prepare you for the DELE exam, or for any other admission or final test back home, according to those levels (A1, A2, B1, B2, C1, C2). We have a big library with of many Spanish text books as well as cultural and historical books, novels, dictionaries, songs, grammar books, exercises books and much more. 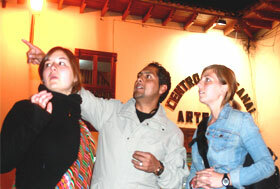 We will introduce you to your teachers on the first day of classes at our centrally located meeting point and from here you and your teacher will start to explore the city, to discover Cusco and feel immersed the Spanish language. 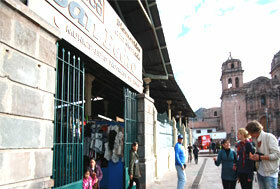 We also organize meetings or activities at central locations in Cusco, at least twice a week. A great way to meet fellow students and to interact with local people.